Home » News » Music program for the New Year’s Eve 2019! For the New Year’s Eve 2019, at main Square in Novi Sad will perform Nele Karajlić, Magnifico and russian dj`s Filatov & Karas. For now, the exact timing of their performances is not yet known. Other programs and artists will be announced later, but it is certain that it will take place in four locations with the participation of more than 50 performers. Authentic restaurants with their gastronomic offer, as well as local producers of craft beer and home-made drinks from Fruška Gora, will also be presented at this location. 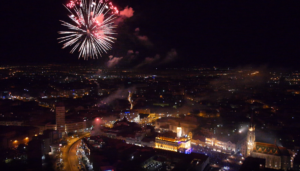 As said, Novi Sad – the European Capital of Culture for 2021, on New Year’s Eve, will change its appearance with the help of light-visual production. The artistic concept of the reception is entrusted to the author’s team of directors, scenographs, light designers and video artists, who are tasked to bring the city center to life on New Year’s Eve.